With Windows Vista becoming more main stream across the enthusiast market, users are finding out that the old standard of running 2GBs of memory just isn't enough. 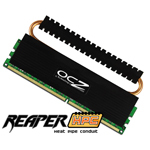 We are going to be taking a look at OCZ's Reaper HPC DDR2 PC2-8500 4GB Edition. We previously took a look at the Reaper modules back in Sept of 07. With the 4GB edition, we will be doing our testing on Vista 64 and also seeing how well it works with our E8400 test rig. We know that OCZ has shown to offer some outstanding memory in the past and hope to see the 4GB kit hold up. I have these personally and I think they are excellent. I can push the heck out of em and they don't budge for me. I'd recommend them any day. And the price not bad either...check the prices out in the review, just a click away. Heck yeah, I see them on sale all the time too. usually for like 80-90 bucks. Great deal!! BTW, great review Tazz. Too bad about the poor OC on yours. Mine run 1600 Mhz easy with Zero problems. I could probably push them more if I wanted. Thanks, you have the 1066MHz version and are getting 1600MHz out of them? Damn, the average that I seen on the 1066 modules was 1200 or so.